Up until now, there have been very few high end video cards that have been capable of complete silence for many reasons - the main one being heat constraints from the GPU's manufacturing process, while the secondary one is the technology available at the time. Zalman have been at the forefront of silent PC cooling for a number of years now, and their heatpipe solutions are no doubt the inspiration for today's product review. Gone are the days when enthusiasts wanted as many fans as they could possibly fit in their case - enthusiasts crave silence in the same way that business users have done for many years. Of course, there is still the niche of extreme enthusiasts who look to get the most out of their system, regardless of the levels of noise pollution their system creates. However, we think it is safe to say that the majority of hardware enthusiasts are looking for products that are fast but quiet at the same time. A classic example of this is the recently announced GeForce 7800 GTX - the fan on that is immensely quiet while the performance is currently unmatched by any other video card available for purchase at this moment in time. Today, we have GECUBE's Radeon X800 XL 512MB SilenCool Edition video card strapped to the test bench. Its cooling system is a little different from the norm - it's based around a dual heatpipe design, two parts copper, three parts aluminium, with the majority of the cooling system located on the back of the card. In fact, there is enough of the cooling system on the back of the card that means it could be classed as a single slot card. However, some people will have issues installing this video card because of the cooling solution. So, it is worth bearing that in mind when considering this video card. Any motherboard with an oversized northbridge heatsink/fan combination located within 20mm of the PCI-Express x16 slot may encounter installation problems with the GECUBE X800 XL SilenCool Edition video cards - the 256MB version is the same size as its 512MB cousin. As you can guess, the cooling solution is silent, but we do recommend that you have some air flow around the video card, as it warmed itself up rather nicely during a heavy gaming session. You can achieve adequate airflow with the aid of a couple of slow spinning 120mm fans, so while the card itself is silent, you will not avoid the need for at least one or two fans spinning. 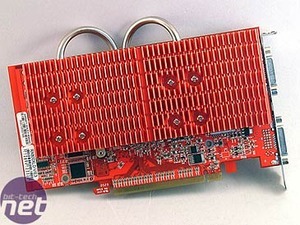 Due to the card featuring a 512MB frame buffer, it requires supplementary power from a 6-pin PCI-Express power connector. We don't think this is a problem, seeing as we've found the power connector to be reasonably useful for overclocking Radeon X800 XL's, and it has also been a requirement on high-end AGP video cards for some time now. The back plate features two DVI connections - that'll please TFT users, and having bought a pair of Dell TFT's for myself this week, I can see the immediate benefits of this. There's also the inclusion of a VIVO port, allowing for a vast array of connectivity options for the multimedia enthusiast.